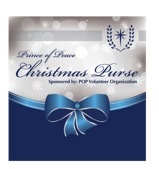 In continuing with tradition, the POP Volunteer Organization is sponsoring the annual Christmas Purse. This program provides an opportunity for school families to show their appreciation for the teachers and staff at Prince of Peace Catholic School during the holiday season. The program is similar to many other Catholic and private schools in the area. • A Parent Volunteer Organization board member will collect the checks and online donations confidentially. • The total dollar amount collected will be divided for each staff member according to the number of weekly employment hours. • The purse will be distributed to All teachers, assistants and school staff through a supplemental paycheck before Christmas. They will also receive a letter of Christmas cheer with the donating families noted. The program is meant to relieve some of the stress in our lives during this busy time while ensuring that the entire school staff is included in the gift giving process. This will also help eliminate individual classroom collections. While it is entirely a personal choice, we encourage the Christmas Purse in place of individual Christmas gifts. We thank you in advance for your generosity and consideration of this very special Christmas program and for your support of our teachers and staff. We are collecting Christmas Purse donations now through December 17, 2018. You may either donate online or drop off your donation at the front office, CLC office, or send in a sealed envelope with your child to his/her homeroom teacher.